After a busy day at the office, it's time for IT support for the kids. Last weeks call for help was an urgent - "The printer isn't printing!" Typically, the printer is off-line, or the wrong printer was selected, but this time was different: paper was coming out, but it was blank. I checked the ink cartridges and they were all fine. I thought maybe the ink level indicator wasn't working, so I put in a new black cartridge. No success. The page was completely blank. The work of fiction needed to be printed, so I changed the font color in the document to navy blue, and it printed fine. After going on line and googling for a solution, I found some support forums where people complained about the low quality of these all-in-one printers. I started to conclude that I had a disposable printer, and given how much the ink costs, the fastest resolution was probably to get a new printer. The problem is that I really like this printer/all-in-one. 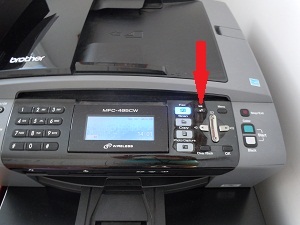 It's compact, and the paper feeder works great for scanning and faxing, so I didn't want to see it go. Turns out the solution was VERY simple: The print head needed to be cleaned. Don't worry, this doesn't involve opening the system and using tools.... it's just a few buttons to press. Press the "Ink" button (red arrow on the photo above), then select "Cleaning", then select "Black", "Color" or "All". In my case, I just needed to clean the black print head, and after two cleaning cycles, the printer was back in action. A test page is generated after each cleaning cycle, and you're prompted to run the cycle again until you're satisfied with the quality. For more detailed instructions, refer to page 155 of the 224 page manual available on-line. Hope this post saves you time if your printer won't print one day.